Over 30 travel companies have donated prizes for the Together Forever Big Prize Draw organised by Westoe Travel following the Ariana Grande terror attack. 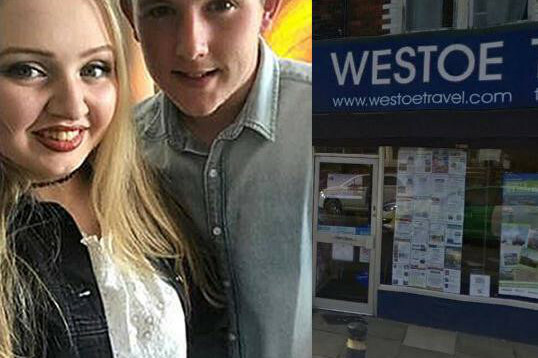 Based in South Shields, the agency is raising money for the families of its trainee Chloe Rutherford and boyfriend Liam Curry, who died in the attack, in Manchester on May 22. Travel companies who have given prizes so far include Emirates, which has donated two return UK-Dubai tickets and Balkan Holidays, who has donated a 7 night Summer 2018 package holiday to Bulgaria. National Holidays is giving away a two-day mystery coach holiday; Superbreak has donated a £100 voucher, while Attraction World has donated a spa day prize. Other prizes include vouchers, hampers and wine. Tickets for the draw cost £5 each and will take place at 12 noon on the 31st August. Details of prizes donated so far can be found on the Westoe Travel website. Anyone who is able to donate a prize or sell tickets can contact sales@westoetravel.co.uk.